Can anybody identfy this plant please ? It has a single central stem, fluffy foliage and bears small white flowers in June. It come up every year in the same shady spot, among ferns and cordylines. Is it a flowers, fern, vegetable, or what ? This is a wild guess - I have an idea that it is called 'Asparagus Fern'. Another guess, I don't think it's a Fern, the fronds don't look right. Do some googling on Sage plants. Can you get a close up of the leaves and flowers, preferably with a piece of white paper held behind them? Definitely Asparagus. It is an edible asparagus seedling, do you have asparagus growing near you? These seedlings will pop up anywhere. Be careful - Asparagus is, of course, edible. BUT Asparagus Fern is not edible! Don't think the fern grows outdoors in UK, but I might be mistaken - what with global warming! 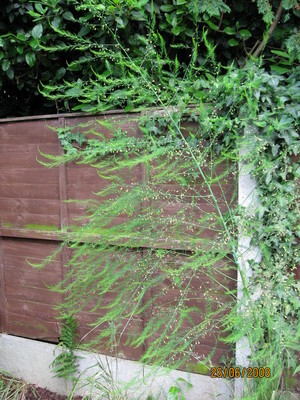 Asparagus fern is hardy and can grow outdoors in West Wales. Don't know about the rest of the UK further north.